Yana Toom kohtus Süürias europarlamendi delegatsiooni koosseisus president Bashar al-Assadiga. 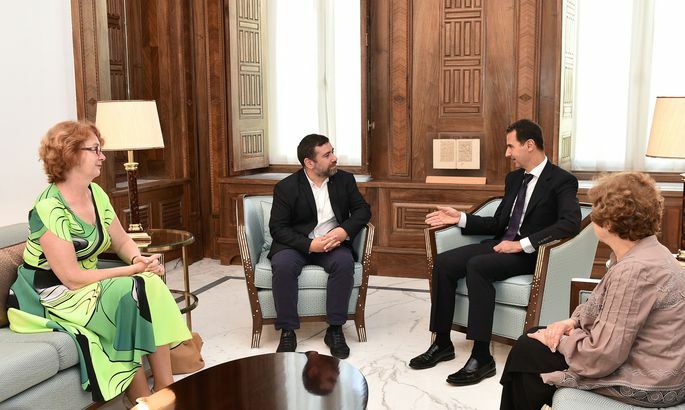 A delegation of the European Parliament including Estonian MEP Yana Toom paid a visit to Syria at the weekend and met with President Bashar al-Assad. The delegation consisted of Javier Couso Permuy (Spain, European United Left), Tatjana Zdanoka (Latvia, Greens-European Free Alliance) and Yana Toom (Estonia, Alliance of Liberals and Democrats for Europe), Toom's office said. The purpose of the visit was to study the Syrian humanitarian situation at first hand, Couso Permuy said. On the first day of the visit the European parliamentarians met with the speaker of the Syrian parliament, Hadiya Abbas, and the primate of the Greek Orthodox Patriarchate of Antioch and All The East, Patriarch John X. They also visited a refugee center and a hospital for the treatment of people who had lost their limbs. «Both Syrian leaders as well as people on the street tried to make one simple thing clear to us: sanctions are doing immense damage to ordinary Syrians,» Toom said. On the second day of the visit a one and a half hour meeting with the Syrian president took place. Assad emphasized that Syria is engaged in a fight against global terrorism and that the security of neighboring countries as well as Europe depends on the success of this struggle. The European Union introduced sanctions against Syria in 2011. They were last extended in May until July 2017. On their way to Damascus the European parliamentarians met in Beirut with leaders of several political parties represented in the Libyan parliament with whom they talked about humanitarian issues and religious safety. According to the parliamentarians, the visit leaves no room of doubt that the discussion on Syrian politics must continue.